In 2002, The Jubilee Fund supported a small business for a sole proprietor operating as Organic Planet. The business was an immediate success and it was determined an expansion was necessary to open a deli across the street from the existing store. However, the expansion experienced several setbacks including cost overruns that by the time it opened its second outlet, cash flow for the existing business had been severely compromised and the suppliers called in their receivables. 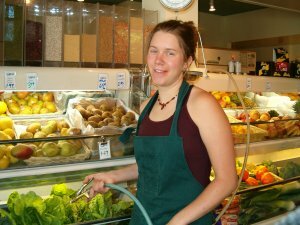 Five workers determined to revive the business, formed the Organic Planet Worker Co-op, and opened on May 1st, 2003 at 877 Westminster Ave. The Co-op provides premium quality organic produce, bulk goods, local meat and other grocery items with a unique deli component offering organic take-out to an environmentally and health conscious clientele. They try to support local producers as much as possible.